Well, game one of the 2012 NBA Finals is in the book--and the story brings back lots of memories. Of playoffs past. Of LeBron James. But I'm not talking about the false narrative (that I've never floated here) that he chokes in crunch time or can't ever win a championship. (Although I'll most likely go to my grave rooting against him ever getting one one.) What I mean is that feeling. That feeling that every single person on the floor, every single person in the stands, and every single person watching on TV knows--who's getting the ball, and that there's nothing in the world that will keep that man from scoring. Tonight it wasn't LeBron's turn. It wasn't 2007. It was 2012, and it was Kevin Durant. Making the opposing team look slow. And old. And utterly unable to stop him late. TGiM did not have a bad game. Forget comparing the fourth quarter stats of Durant and James. Irrelevant. NBA's studio analysts just showed a stat that they seemed to think indicted James for his poor fourth quarter play. But the truth is, James had a solid game, all the way through. Just not transcendent. Seven points in the fourth, an average of 7 and change each period before that. Big deal. 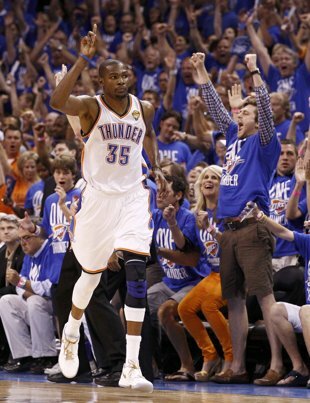 It wasn't TGiM or his sidekicks that lost this game, it was KD that won it. But his opponent was transcendent. 36 points from Kevin Durant, 17 in the fourth quarter. And for a big stretch of it, everyone knew he was going to take the ball, and do whatever he wanted with it. Just like Cavaliers fans knew in May 2007.